Cellulitis is clinical condition that is caused by the inflammation of sub-cutaneous tissue. Conventional treatment of cellulitis is based on the use of antimicrobials. Treatment by Cupping is one of the oldest ways of healing for more than 5000 years; now reemerging in this modern age and is being practice in many countries such as USA, UK, Germany and China. individual was again stung by honeybee on the planter surface of the right big toe and on this occasion immediately cupping was applied; that gave quick relief and no inflammation developed. Cupping therapy may be an effective measure in the treatment of honey bee sting induced cellulitis. Cellulitis is an inflammation of sub-cutaneous tissue (Ellis 2000; Swartz and Pasternack 2005), that is usually secondary to multiple bacteria’s, such as Staphylococcus and Streptococcus species (Bisno and Stevens 1996; Donahue and Schwartz G 1998; Howe and Jones 2004). Usually the causative organism enters through the broken skin. Usually the cellulitis is diagnosed on clinical basis and treatment is focused on the use of antimicrobials (Ellis 2000; Swartz and Pasternack 2005; Stevens 2005; Moran 2006). Despite following all standard treatment protocols, the reported mortality and morbidity of cellulitis is still high (Carratal et al., 2003). Treatment by Cupping is one of the oldest ways of healing for more than 5000 years. Presently it is getting re-attention in many parts of the globe such as Asia, America and Europe (Kemper et al., 2000 Sherman et al., 2001; L¨udtkea et al., 2006). Cupping treatment has been successfully used as an efficient method of treatment in wide array of ailments such as arthritis, migraine, anxiety (Hennawy, 2004; Kaleem et al., 2007). By description, cupping therapy is a process of drawing blood from the cutane of the individual by creating a partial vacuum above the scarificated mark (L¨udtkea et al., 2006). 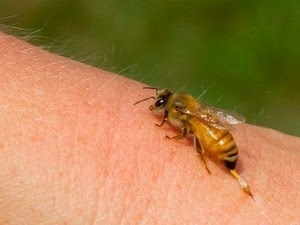 Honeybee on the forearm area stung a 38-year-old male. Six hours after the sting, the patient was seen by his family physician. At the site of the sting, mild induration (5 mm), encircled by an erythematic patch was seen. A clinical diagnosis of early Cellulitis was made. The patient was empirically, given an antimicrobial (Lincomycin-oral 600mg/twice a day). In next 6 hours, the lesion was noted to progress and oral Lincomycin was changed to injectable from. Three hours later, flush of erythema was further increased to 5 inches towards the cubital fossa and 1-1/2 inches towards the wrist joint. At this time, it was considered, that probably Lincomycin is not a right choice, so it was replaced by Augmentin 1g (oral) B.D and Metronidazole 500 mg (oral) TID. Over the next 8 hours, despite this treatment the lesion continued to be deepened and spread. The skin of the whole forearm became violently red and hot. Looking at unresponsive behavior of the disease, Ciprofloxacin 500mg TID (oral) was also added in the treatment regimen. From beginning, the patient was also receiving Celecoxibe 100mg BD as an anti-inflammatory agent. Looking at the worsening clinical condition of the patient, he was referred to a senior medical consultant, well experienced in wet cupping therapy. At this point of time, it was decided to apply wet cupping over this aggressive cellulitis. With standard method and sterilization (L¨udtkea et al., 2006; Farhadi et al., 2009); wet cupping was done on the site of maximum inflammation by applying approximately 30 -35 superficial cuts and approximately 7-9 ml of blood (90% clotted and 10% liquid form) was cupped out. An immediate (25-35%) clinical improvement was noted in terms of reduction in all signs of inflammation. After 12 hours, a second cupping was conducted over the same points. Approximately 4-6 ml of blood was taken out from every point. Remarkable clinical recovery was noted and in signs of inflammation; and the patient felt dramatic relief in his over all condition. All cuts of cupping therapy healed completely in the next 4 days without complications. During and after cupping the patient was maintained on Augmentin (1 g BD-oral for 5 days). Unfortunately, after 45 days, honey bee, again stung the same patient over the planter surface, near the base of the big toe. This time, at the site of the sting, three sessions of cupping therapy were conducted every 12 hours. The ensuing Cellulitis resolved without complications. This time the patient did not receive any medication. Kini et al., 1994; Franco et al., 1994; Gowlik et al., 2004). Cellulitis is a commonly occurring clinical disorder. The most suitable method of treating this morbid condition is the judicious use of antimicrobials. Some time the virulence of the affecting microorganism, inadequacy of antimicrobials and the late presentation of the patient in the clinic and finally the presence of any co-morbid condition such as diabetes pose problems in the management of cellulitis. In the reported case, the affected person was a healthy male, who presented to the clinician at somewhat early phase of his illness and took a plethora of antimicrobials that belonged to different classes of pharmacological agents. The antimicrobial combination used during the treatment have been effective against most of the bacteria’s that can broadly be classified in gram positive, gram negative and anaerobes. The dose of antimicrobials was also noted to be reasonable. Despite the use of reasonable combination, the tempo of the disease was very fast. In this situation, cupping therapy was given to the patient, improved clinical state dramatically at a stage when his clinical status was deteriorating rapidly despite reasonable effort. It can be assumed that either the toxin of the sting or the secondary bacterial infection was very virulent. important base line theory of CAM; is that the internal organs of the corpse illustrate definite relations to definite areas of the body’s exterior recognized as ‘‘reflexuous zones’’. Handling of these reflexuous zones exhibits special effects over the corpus reflected as changes of tissue steadiness and puffiness of tissue volume. Current controlled observational studies on diverse clinical situation such as ischemic heart diseases, vascular disorders, migraine headache, dysmenorrhea, have shown numerically important links that present among diseases and their particular reflexous areas (L¨udtkea et al., 2006). It can be presumed that during cupping therapy many desired changes would have been taken place in the affected tissues such as elimination of toxins or possibly microorganism that caused the improvement in the clinical condition. Recently Bilal et al. analyzed and compared the Cupping blood and venous blood and found significant difference between two blood samples.Usually at one point of cupping an average of 35-45 superficial cuts are applied. Surprisingly, after cupping the wound, healing was very fast; usually in these types of infected wound, one expects delay in healing. Another noteworthy point is a possible secondary bacteremia on manipulation of an active lesion did not occur. On the first occasion, it can be assumed that the patient was covered with antimicrobials; but fascinatingly this was not the case on the second occasion and the patient directly had the sessions of cupping therapy without antimicrobial cover. Cellulitis is a commonly occurring clinical problem in medical practice. Some times conventional treatment fails to achieve the desired goals. In this situation, application of cupping therapy might be beneficial. Bilal, M. Khan RA, Ahmed A. and Afroz, S. 2011. Partial evaluation of technique used in cupping therapy. J. basic appl. sci. 7: 65-68. Bisno, AL. and Stevens, DL. 1996. Streptococcal infections of skin and soft tissues. N Engl J Med. 4:240-245. Carratal, J. Rosn, B. Fernandez-Sabe, N. Shaw, E. Rio, O. Rivera, A. and Gudiol, F. 2003. Factors Associated with Complications and Mortality in Adult Patients Hospitalized for Infectious Cellulitis. Eur J Clin Microbiol Infect Dis. 22:151-157. Donahue, SP. and Schwartz, G. 1998. Preseptal and orbital cellulitis in childhood. A changing microbiologic spectrum. Ophthalmology. 105:1902-1906. Ellis, CL. 2000. Cellulitis. Saunders Manual of Medical Practice, RE Rakel, ed., 2nd ed., W.B. Saunders, Philadelphia, pp.1127-1128. Franco, FO. Benvenuti, LA. and Fan, HW. 1994. Severe and fatal mass attacks by killer bees (Africanized honey bee-Apis mellifera Scutellata) in Brazil: clinicopathological studies with measurement of serum venom concentrations. Q J Med. 87:269-282. Farhadi, K. Schwebel, DC. Saeb, M. Choubsaz, M. Mohammadi, R. and Ahmadia, A. 2009. The effectiveness of wet-cupping for nonspecific low back pain in Iran: A randomized controlled trial. Complementary Therapies in Medicine. 17: 9-15. Gowlik, R. Rymarczyk, B. and Rogala, B. 2004. A rare case of intravascular coagulation after honey bee sting. J Investig Allergol Clin Immunol. 14:250-252.
treatment for Anterior Knee Pain and its potential role in Health Promotion. The Internet Journal of Alternative Medicine TM. Kemper, KJ. Sarah, R. Silver-Highfield, E. Xiarhos, E. Barnes, L. and Berde, C. 2000. On pins and needles? Pediatric pain patients’ experience with acupuncture. Pediatrics. 105:941-947. Kini, PG. Baliga, M. and Bhaskaranand, N. 1994. Severe derangement of the coagulation profile following multiple bee stings in a 2- year-old boy. Ann Trop Paediatr. 14:153-155. Moran, GJ. et al. 2006. Methicillin-resistant S. aureus infections among patients in the emergency department. N Engl J Med. 355: 666-674. Ouyang, C. Lin, SC. and Teng, CM. 1979. Anticoagulant properties of Apis mellifera (honey bee) venom. Toxicon. 17: 179-201. L¨udtkea, R. Albrechtb, U. Stangeb, R. and Uehlekeb, B. 2006. Brachialgia paraesthetica nocturna can be relieved by ‘‘wet cupping’’ – Results of a randomised pilot study. Complementary Therapies in Medicine. 14: 247-253. Sherman, KJ. Cherkin, DC. and Hogeboom, CJ. 2001. The diagnosis and treatment of patients with chronic lowback pain by traditional Chinese medical acupuncturists. J Altern Complement Med. 7:641-650.
infections. Clinical Infectious Diseases. 41: 1373-1406. Swartz, MN. and Pasternack, MS. 2005. Principles and Practice of Infectious Diseases Cellulitis. Section of Cellulitis and subcutaneous tissue infections. GL Mandell et al., 6th ed., Elsevier Churchill Livingstone, Philadelphia, 1:1178-1180. Our thanks to Dr Asif Ahmed of Memon Institute of Hijama Therapy in Karachi, Pakistan for sharing the above post. If you have any questions or want to leave some feedback on their course, then please do so via a comment* below. < br />If you are a hijama therapist or patient and are happy to share your knowledge or experience via a guest blog-post like the one above, please contact us by filling the form on the top right corner of the blog.